The Greytown Trail is a scenic 5km walking and cycling track connecting Greytown's quieter streets to the nearest train station at Woodside. If you're arriving by train, why not bring your bike and ride into town to work up an appetite for lunch? Or catch a pre-booked Rimutaka Shuttles or Martinborough Shuttles from the station. From the Greytown end, the trail starts at Cotter Street, the second left off Humphries Road (turn off Main Street at the Challenge Service Station). You can also link up with another cycleway running from Udy Street to the Waiohine River. 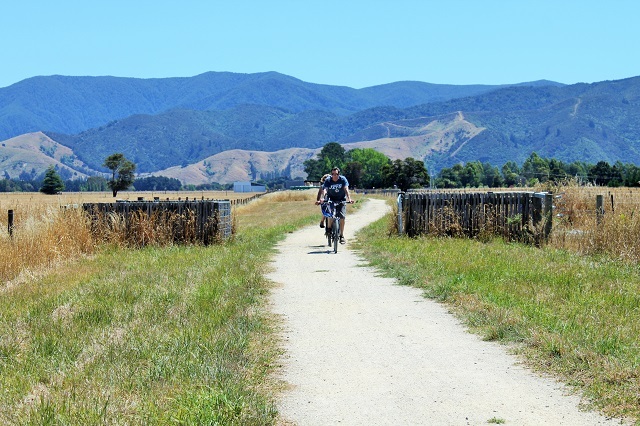 The Greytown Trail is suitable for prams, road and mountain bikes. It's not suitable for racing bikes, horses or motorbikes. And please keep your pooch on a leash!